Western Blot analysis of IGKC expression in transfected 293T cell line (H00003514-T01) by IGKC MaxPab polyclonal antibody.Lane 1: IGKC transfected lysate(25.74 KDa).Lane 2: Non-transfected lysate. 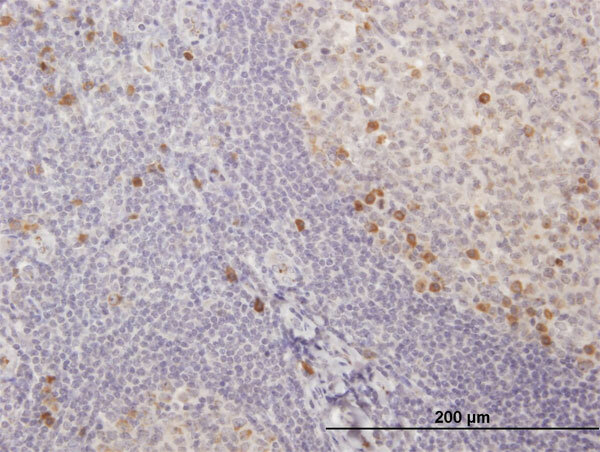 IGKC MaxPab rabbit polyclonal antibody. Western Blot analysis of IGKC expression in mouse kidney. Western Blot analysis of IGKC expression in transfected 293T cell line (H00003514-T02) by IGKC MaxPab polyclonal antibody.Lane 1: IGKC transfected lysate(25.60 KDa).Lane 2: Non-transfected lysate. Immunohistochemical staining of IGKC on formalin fixed, paraffin embedded human tonsil with IGKC monoclonal antibody, clone SPM508.